Planning a Friday night poker party? Why not go all out this weekend and spoil yourself and friends. Take a look at all of our poker party decorations to decorate your poker room in your house. We have great products like our Casino Sign Cutouts, Card Suit Whirls, casino ceiling decoration, and card suit stringer that all make simple hanging decorations. Hang them around your poker room to spice things up a little. Get our Playing Card Cascade Centerpiece for your snack table and serve all your munchies from our casino snack trays! You can browse and sort all of our Poker Party Decorations here or use the search feature above. Decorations for card parties can be as simple or extensive as you wish. 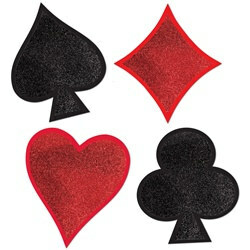 We have lots of poker theme decor to help you throw a great poker theme party. If you are hosting a poker party you need to check out the decorations at PartyCheap.com. We have decorations to set the theme for your next poker party. Even if you are only having over a couple of the guys, it is nice to have some specific decorations to set the scene so they won’t feel as bad when you take all of their money. Serve your poker friends chips and snacks in a Casino Club Snack Tray or any of our snack trays. Or try to take their mind off of their poker game by putting a card suit centerpiece in the middle of the table. If you string up some red dice electric lights perhaps that will help to distract them from the poker game at hand. 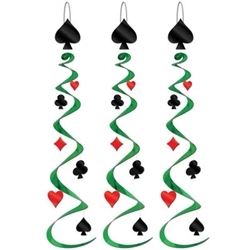 We have a lot of poker theme hanging decorations including playing card suit stringers, card suit whirls, and a casino cascade with all of the playing card symbols. You can decorate the walls of your poker parlor with 17 inch Card Suit Cutouts or 25 inch Playing Card Cutouts. These decorations can also be used for Casino night parties as well. If you are hosting a Texas hold’em poker party you may want to consider the Texas Hold’em Scene Setter decoration. This is a large decoration that is easily attached to your wall with either tape or push pins. We also carry a Texas Hold’em Room border that has the look of playing cards and chips on green felt. And speaking of poker felt, we have a Green Texas Hold-Em Layout felt you can use on your own table. Finally, we have Poker Party Balloons and poker signs to let your guests know they have found the right place to play poker. Have fun planning your poker party and don’t forget to check out our selection of Casino decorations as well.